Let me introduce you "Luckyvotes", a new upvote bot, that currently has 14400 SP delegation, and is expected to have more boosts in the near future. Current 100% upvote worth 4.04 SBD. 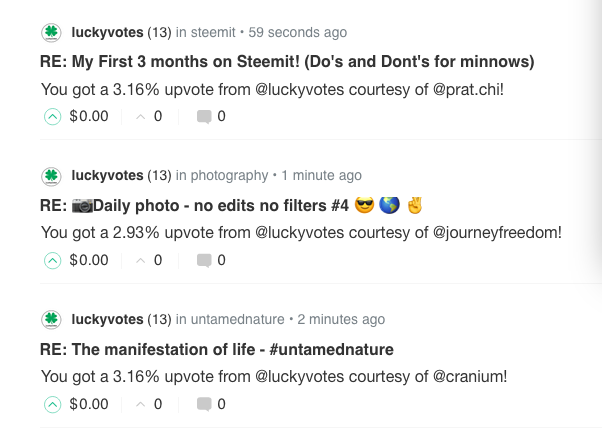 Luckyvotes upvotes in every 2.4 hours, ten times a day (this is one voting period). Vote shares will be decided by​ the percentage of the amount you sent divided by the total amount sent in the actual voting period (2.4 hours). Eg. 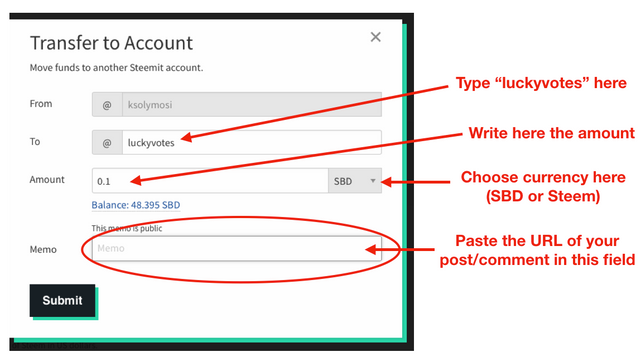 if you are the only one bidding in the given period, you will have a full upvote (100%), if there is a 0.1 SBD send and you sent 0.4 SBD, then you will receive a 80% upvote, etc. Minimum payment for votes is 0.1SBD. Posts cannot be older than 6 days. Voting for comments is also allowed. The bot sends back invalid bids automatically. You are able to see the progress of the voting cycle on the Bot Tracker page. I hope, you will like this bot! Good luck. Do you send refunds if people send less than the minimum value or for posts which are too old? 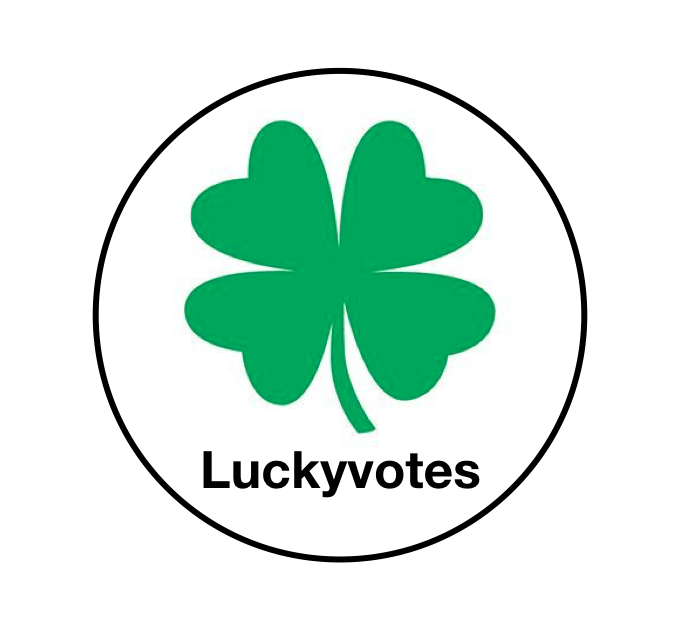 @luckyvotes, does it work every day? I have sent 1 SBD to you, thanks. All right, have a nice day! A good name, a good logo, and from testing on one of my own posts, it looks like the bot is working as intended. Hello, nice to meet you! I upvote your post, please check out my post and kindly upvote if you like it! 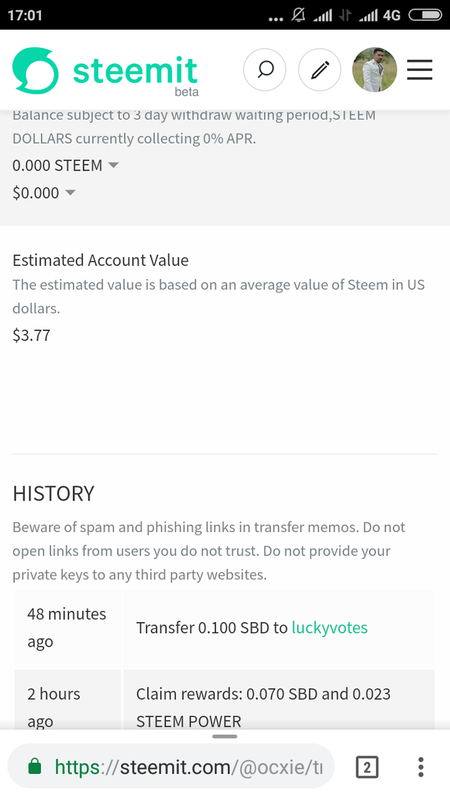 To get 100% upvote, what amount of steem or SBD should be sent to your @luckyvotes account, and what amount of value is given? For a 100% upvote, you should be the only one sending money in a bidding round. That has a low chance. The maximum upvote value right now is 4.57 SBD. how to set want to run a voting bot in steemit bot tracker? 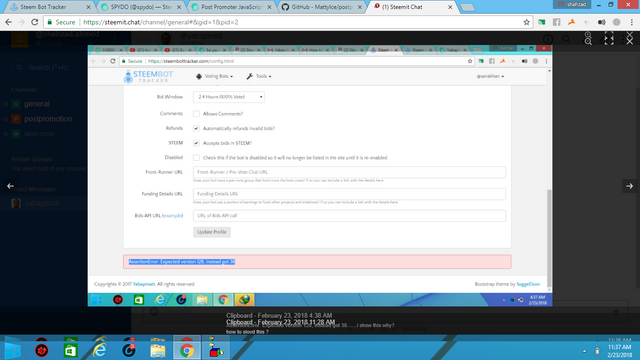 i want this https://steembottracker.com/ my owner bot how to set it my owo bot on this web? good luck @luckyvotes bot ..!!! Refunded, sorry for the mistake. why you guys are doing cheating?? Please read carefully the warning on BotTracker page... 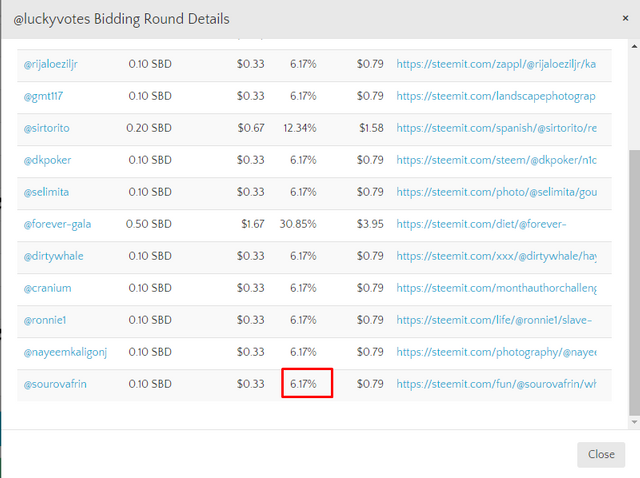 If bids arrive just before seconds of voting, the percentage will be lower. But if you check BotTracker after the round is over, it will show the proper percentage. Hi..I already send 0.1 SBD. How to know, that is work or not? I saw my post without upvote until now?